Oxyfuel flame cutting is the most economical process for the cutting of mild and low alloy steels, even with weld preparations. It is one of the most important production processes in the metal industry. Oxyfuel cutting is a combustion process using oxygen/fuel gas flame. The heating flame brings the material up to its ignition temperature. Then a jet of Oxygen at least 99,5 % pure is blown onto the heated spot. The Oxygen jet oxidizes the metal. The torch is moved and a narrow cutting kerf is created, removing the slag from the kerf. The quality of the cut depends on the surface condition of the material, cut-velocity and thickness. All low alloy steel with a material thickness up to several decimeters can be cut with this process. Despite the increasing significance of the other cutting processes such as plasma and laser cutting, oxyfuel flame cutting is still a very economical process. For heavy material thicknesses up to 900mm there is no alternative to flame cutting. Machine flame cutting ensures reliable hole-piercing, good cutting quality and allows the production of components to their finished sizes without the need for further processing. For weld seam preparations V, Y and K cuts can be produced. Plasma cutting was originally developed for the thermal cutting of materials which were unsuitable for flame cutting, such as high alloy steels or Aluminum. Today, the process is also used for the economical cutting of thin, low alloyed steels. One common description of plasma is to describe it as the fourth state of matter. We normally think of the three states of matter as solid, liquid and gas. For a common element, water, these three states are ice, water and steam. The difference between these states relates to their energy levels. When we add energy in the form of heat to ice, the ice melts and forms water. When we add more energy, the water vaporises into hydrogen and oxygen, in the form of steam. By adding more energy to steam these gases become ionised. This ionisation process causes the gas to become electrically conductive. This electrically conductive, ionised gas is called a plasma. The plasma cutting process, as used in the cutting of electrically conductive metals, utilises this electrically conductive gas to transfer energy from an electrical power source through a plasma cutting torch to the material being cut. 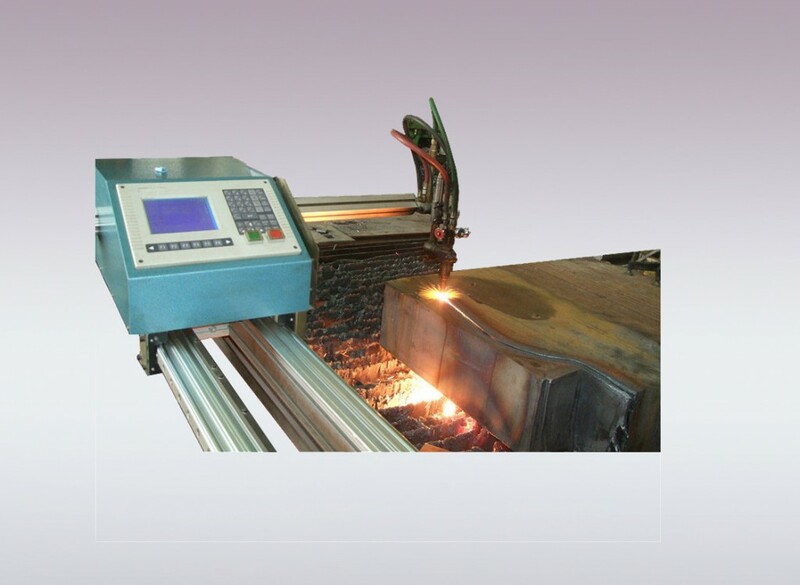 The basic plasma arc cutting system consists of a power supply, an arc starting circuit and a torch. These system components provide the electrical energy, ionisation capability and process control that is necessary to produce high quality, highly productive cuts on a variety of different materials. The power supply is a constant current DC power source. The open circuit voltage is typically in the range of 240 to 400 VDC. The output current (amperage) of the power supply determines the speed and cut thickness capability of the system. The main function of the power supply is to provide the correct energy to maintain the plasma arc after ionisation. The arc starting circuit is a high frequency generator circuit that produces an AC voltage of 5,000 to 10,000 volts at approximately 2 megahertz. This voltage is used to create a high intensity arc inside the torch to ionise the gas, thereby producing the plasma. The Torch serves as the holder for the consumable especially nozzle, and especially electrode, and provides cooling (either gas or water) to these parts. The nozzle and electrode constrict and maintain the plasma jet. new released heavy duty portable cutter,2500x3400mm,bigger working size. 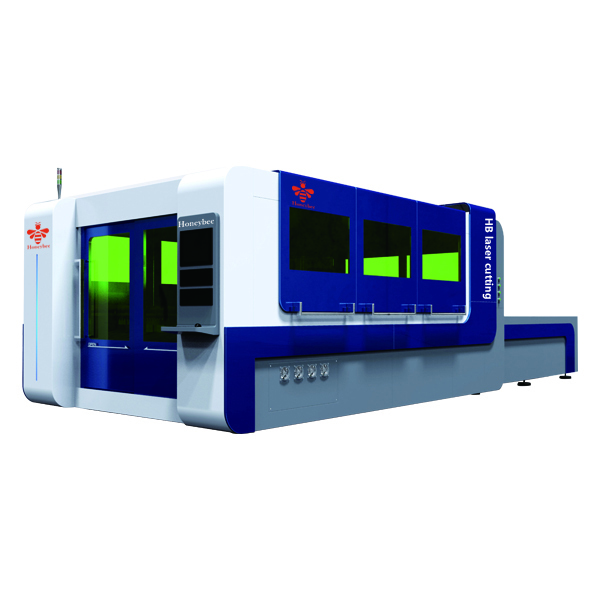 Laser cutting machine is always connected to several numerically-controlled rotary tables to achieve numerical controlled cutting. It only needs to change the NC program to adjust to components of different shapes, which can make 2D cutting as well as 3D cutting. 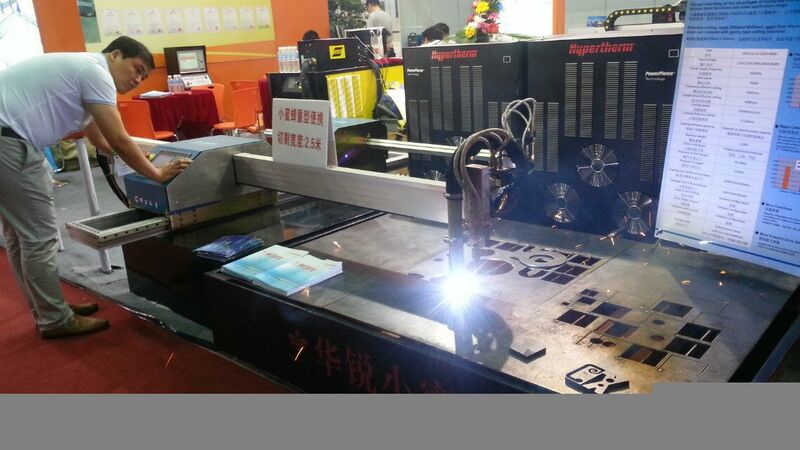 When cutting low carbon steel sheets of 2mm thickness, the speed of 1200W laser cutting is 600cmmin; when it is 5mm thick polypropylene resin plate, the cutting speed is 1200cmmin. The material needs no clamping fix in laser cutting process. Laser cutting features thin kerf. The two sides of kerf are parallel and the kerf is vertical to the surface. The cutting precision can reach to ±0.05mm. The cutting surface is clean and nice, with roughness of tens of microns. The cut components can even come into use directly without further machining. After laser cutting, the heat effected area is very small and material near to kerf has not been affected, making little deformation, high cutting precicion and perfect geometrical shape. Laser cutting is non-contact cutting, which means no tool wear problem. When processing different shapes, there is no need to change tools, the only way is to alter the output parameter of laser. The whole laser cutting process features low noise, little vibration and little pollution. CNC Machining is a process used in the manufacturing sector that involves the use of computers to control machine tools. Tools that can be controlled in this manner include lathes, mills, routers and grinders. The CNC in CNC Machining stands for Computer Numerical Control. are what really sets the system apart for use in CNC machining. coordination, location and speeds. With CNC machining, the computer can control exact positioning and velocity. CNC machining is used in manufacturing both metal and plastic parts. “cutting air” and it is an important step because any mistake with speed and tool position could result in a scraped part or a damaged machine. jobs that need a high level of precision or very repetitive tasks. industrial arts and mechanical drafting, as well as computer usage.